Our fascination with true crime these days is never-ending, so of course, we’re looking forward to watching Hulu’s The Act, starring Patricia Arquette and Joey King, which premieres on March 20. Based on the incredible (and incredibly sad) true story of Dee Dee Blanchard and her daughter, Gypsy Rose, this crime has become the focal point of lengthy investigative reports, like Buzzfeed’s in-depth look from 2016, and the 2017 HBO documentary Mommy Dead and Dearest. Now, a new version of the story is coming to Hulu, looking to dramatize the Blanchard’s story based on what we know so far. 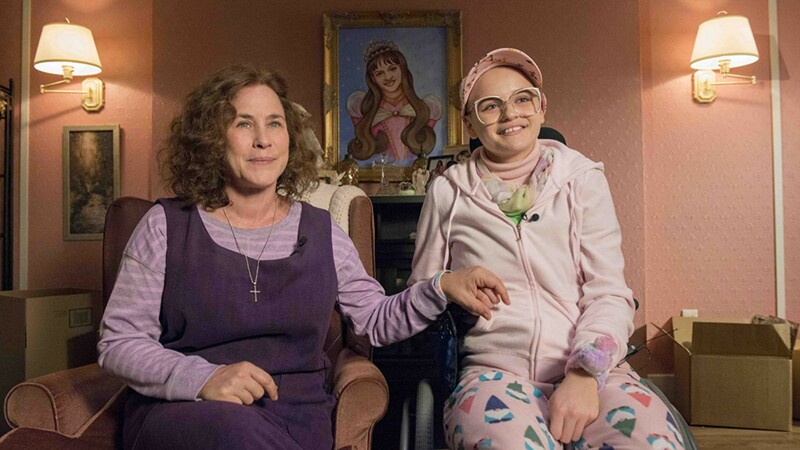 Hulu’s The Act centers on the story of Dee Dee Blanchard (played by Patricia Arquette) and her daughter, Gypsy Rose (played by Joey King), a girl plagued with life-threatening sicknesses and allergies as well as mental and physical disabilities from birth — if you believe Dee Dee’s account of her health history. On a summer night in 2015, Dee Dee’s body was discovered by police. She’d been stabbed to death and Gypsy – at the time, she was in her late teens – was missing. Why was Dee Dee killed? What happened to Gypsy? How had it gotten to this point? Things aren’t always what they seem it was no different in the case of the Blanchards. While Hulu’s eagerly-awaited limited series explores the Blanchard’s story, we want to remind you about the key points, which make it almost unbelievable if it wasn’t true. What was wrong with Gypsy Rose Blanchard? We know from Buzzfeed’s investigative report and the HBO documentary the Dee Dee was a single parent, raising Gypsy by herself in Missouri. Outwardly, Dee Dee and Gypsy appeared to have a close, loving relationship. To the world, Dee Dee was a devoted mother and caregiver to Gypsy. Gypsy suffered from a number of illnesses at any given time, per her mother’s claims, including leukemia, muscular dystrophy and epilepsy. A community of people rallied around the mother and daughter, thinking Dee Dee was a kind and selfless person who seemed to always be willing to lend a hand. The Blanchards even got a wheelchair-adapted house from Habitat for Humanity, money through donations and trips through organizations like Make-a-Wish Foundation. In reality, Gypsy was never born with these illnesses. Rather, Dee Dee artificially created symptoms to mimic the illnesses she was telling doctors Gypsy was sick with. It was learned after Dee Dee’s murder that Gypsy suffered from was a form of abuse called Munchausen by proxy, in which a person thrives on the attention they get for being a caregiver to a chronically-ill person, intentionally making them sick by various means in order to continue receiving the desired attention. The name Munchausen syndrome was first coined in 1951 by a British doctor who referenced Baron Munchausen, a historical figure known for telling outlandish tales of his exploits. Per Buzzfeed, Dee Dee began telling people her daughter was sick when she was mere months old. Her then-husband, Rod Blanchard, was told by Dee Dee that Gypsy had sleep apnea and needed a breathing machine. By the age of seven, Gypsy was in a wheelchair as Dee Dee said she couldn’t walk. She had no hair as Dee Dee shaved her head to mimic the results of chemotherapy because Dee Dee told people that Gypsy had leukemia. She had Gypsy fitted with a feeding tube and lied to her about how old she was, to make her seem younger. She told people that Gypsy had the mental capacity of a seven-year-old, and pulled her out of school to homeschool her. Considering Gypsy spoke with a high, childlike voice, it was enough to convince everyone that Dee Dee was telling the truth. The abuse that went along with this case of Munchausen by proxy was more than just psychological. Dee Dee seemed to exert “total control” over Gypsy, as reported by Cosmopolitan. Dee Dee always held Gypsy’s hand and would squeeze it tightly when she said things Dee Dee didn’t like. At home, she allegedly used a coat hanger or her palm to strike Gypsy. When Gypsy tried to run away once to meet up with a man she met on the internet, Dee Dee broke her computer and phone with a hammer, then threatened to do the same to Gypsy’s fingers if she did it again. Gypsy also claimed that Dee Dee tied her to her bed with a dog leash and handcuffs after that incident. But Dee Dee couldn’t stop Gypsy from growing older and wanting to do things other teens did, like date. Gypsy met Nick Godejohn on a dating site and used the time after Dee Dee went to bed and other stolen moments to message him and carry on a relationship. She devised a plan for Dee Dee to meet Godejohn when they bumped into one another at a movie theater, thinking the couple would pretend they were hitting it off after meeting for the first time. But Dee Dee apparently didn’t like Godejohn, and Gypsy’s plans for a normal teen experience were dashed. After a failed attempt to run away together, Gypsy and Godejohn formed the plot to kill Dee Dee. On the night it finally happened, it was Godejohn who killed Dee Dee, according to testimony. Gypsy hid in another room and listened to the murder, trying to drown it out. They drove to Godejohn’s home and hid until police discovered them days later and brought them in under arrest. Today, Gypsy is serving a 10-year prison sentence for second-degree murder. Season one will be based on the investigative article by Buzzfeed which we’ve also talked about here and will explore the relationship between mother and daughter. The Act premieres on Hulu on Wednesday, March 20.